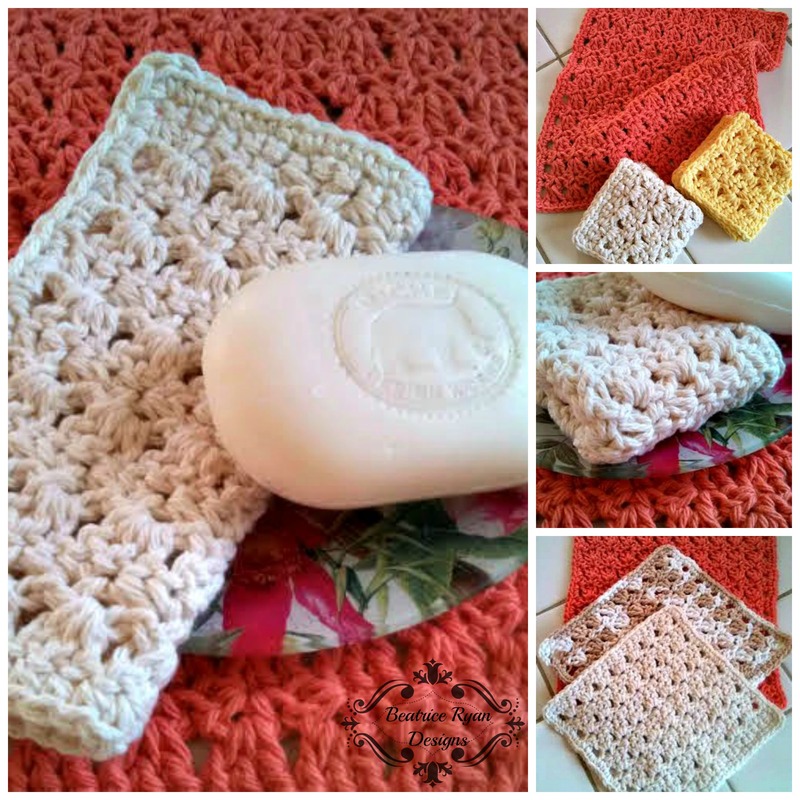 The Amazing Grace Spa Trio is the 5th Free Crochet Pattern in the Amazing Grace Series... This series is dedicated to Breast Cancer Awareness! Please consider donating to someone suffering or recovering from cancer with these patterns or to a Cancer Foundation! 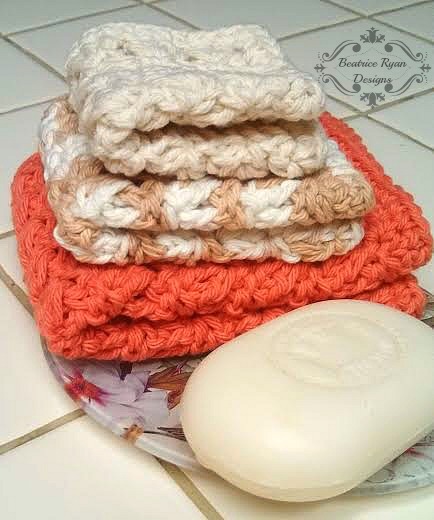 The Amazing Grace Spa Trio is made up of 3 Cotton Crocheted Cloths in varying sizes~Perfect for a Cancer Patient! By using quality uncolored cotton yarn, you can make a nice gift set that will be gentle for cleansing and uplifting for those who are suffering or recovering from cancer! Of course you can also make them for personal use and gifts for friends! Click Here to add this pattern to your Ravelry queue and favorites!! Each item takes 100-300 Yards Cotton Yarn. Row 2: Turn, Ch 1, Sc in 1st St, Skip next Stitch, *Sc, Ch 2, Sc all in the next stitch. Skip next 2 Stitches*, Repeat * * across to the last 2 stitches. Skip stitch and Sc in the last stitch. = 6 Chain 2 Spaces and 1 Sc on each end. Row 3: Turn, Ch 3 (Counts as DC), 3 Dc in next Ch 2 Space (Dc Cluster made). Repeat Dc Cluster in each Ch 2 space across. Dc in last stitch. = 6 Dc Clusters and 1 Dc on each end. Row 4-11: Repeat rows 2 & 3 four more times. Edging: Ch 1, Working along the side edge, *Sc 18 stitches evenly to corner. 3 Sc in corner. * Repeat * * around. Join with Slip Stitch to beginning. Finish off. Weave in ends. Row 2: Turn, Ch 1, Sc in 1st St, Skip next Stitch, *Sc, Ch 2, Sc all in the next stitch. Skip next 2 Stitches*, Repeat * * across to the last 2 stitches. Skip stitch and Sc in the last stitch. = 8 Chain 2 Spaces and 1 Sc on each end. Row 3: Turn, Ch 3 (Counts as DC), 3 Dc in next Ch 2 Space (Dc Cluster made). Repeat Dc Cluster in each Ch 2 space across. Dc in last stitch. = 8 Dc Clusters and 1 Dc on each end. Row 4-15: Repeat rows 2 & 3 Six more times. Edging: Ch 1, Working along the side edge, *Sc 24 stitches evenly to corner. 3 Sc in corner. * Repeat * * around. Join with Slip Stitch to beginning. Finish off. Weave in ends. Row 2: Turn, Ch 1, Sc in 1st St, Skip next Stitch, *Sc, Ch 2, Sc all in the next stitch. Skip next 2 Stitches*, Repeat * * across to the last 2 stitches. Skip stitch and Sc in the last stitch. = 10 Chain 2 Spaces and 1 Sc on each end. Row 3: Turn, Ch 3 (Counts as DC), 3 Dc in next Ch 2 Space (Dc Cluster made). Repeat Dc Cluster in each Ch 2 space across. Dc in last stitch. = 10 Dc Clusters and 1 Dc on each end. Row 4-21: Repeat rows 2 & 3 Nine more times. Edging: Ch 1, *Working along the side edge, Sc 36 stitches evenly to corner. 3 Sc in corner, Sc 31 along the bottom/top edge, 3 Sc in corner. *, Repeat * * around. Join with Slip Stitch to beginning. Finish off. Weave in ends. These are beautiful. And what a wonderful cause. Perfect… I will head over your way!!! Thank You!! Thanks… I hope you love them!! These are really lovely, thank you for posting them. What yarn would you recommend? For mine I used a basic cotton yarn like cream and sugar.. I also used a more cotton yarn from Lion Brand. Thank you! I am a binger and I am not sure what you mean by 4,6,9 more in each pattern. Does that include the 4-11 etc. and then do 4 more rows of 2&3. Please help. I love your pattern and these are going someone who just lost her husband. This means you will do row 1-3, then for rows 4-11 (in the facecloth) you will repeat rows 2 & 3 until you have 11 rows total… this makes you repeat rows 2 & 3 four times to get enough rows to make 11 the total 11 rows. I love these and can’t wait to make them. Just wondering what kind of cotton yarn did you use? Thanks! I really miss the Terry type baby yarn that was discontinued a number of years ago. I made lots of bath sets and the pastel colors were so pretty an the yarn was a perfect thickness ans so soft for these projects. These are wonderful – thank you so much for sharing your pattern and talent with the rest of us. Must try these – love that you have the number of stitches at end of rows – makes it easier. Many times you follow a pattern and you are left in the lurk because you are not sure you are on the right track. Many thanks for that and again for sharing your beautiful pattrn for all those sizes. Makes a wonderful gift for Mother’s Day or any other occasion you need a gift such as this. Sorry, me again! I forgot to ask you what size are these cloths. I am a tight crocheter and sometimes I have to add more stitches in order for it to look right or they are too small. Many thanks again. I don’t have a size listed… so if you crochet tight I would go up a hook size. Me again, what size is this when finished? I am a tight crocheter and would like to know to see if I am on the right track or if I am really off base. Many tks again.